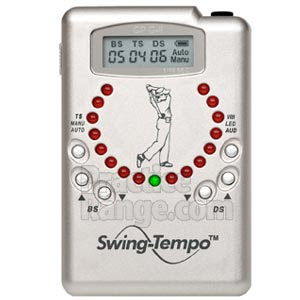 It no question Vijay Singh is the hottest golfer right now and it could have alot to do with a small electronic device called the "Swing Tempo". VJ uses it during his practice routines keeping his swing in tune. One after another he hits balls as he listens through headphones to a rhythmic calibration of the ideal tempo and timing of his backswing and downswing. It's a small digital device that's show below. If VJ has problems with his tempo tell me hackers like myself definitely need something like this. I know I've struggled at times with my tempo. Check out the video below of VJ using the Swing Tempo and comparing the sound to a light saber from Star Wars. I definitely could see VJ as a Jedi.